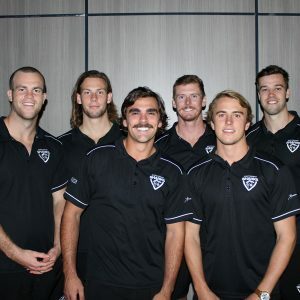 Southport Sharks announced their NEAFL Leadership Group for the 2018 season at the season launch last night held in Sharks Events Centre. Congratulations to our Co-Captains, Andrew Boston and Seb Tape and Vice-Captain, Ryan Davis who will lead the club throughout the 2018 NEAFL season. They are joined by Jordan Taylor, Josh Clayton and Michael Manteit who complete the 2018 Leadership Group. With the NEAFL season opener against Canberra Demons on Good Friday at Allinsure park, we wish the coaches and players the best of luck for the season ahead. View Southport Sharks player profiles for 2018 on our website. Photo (L-R): Jordan Taylor, Josh Clayton, Andrew Boston, Ryan Davis, Michael Manteit and Seb Tape.